I have been remiss in my wardrobe postings. When life get’s busy, I have trouble keeping everything going. So today let’s play a little catch up shall we? #1 – Canary yellow skirt from Lane Bryant, yellow/navy paisley top from Dress Barn, navy polka dot sweater from Land’s End and my JCrew flats. All pieces I have had for several seasons save the yellow skirt. That one is newish and I love it!! It makes me smile. 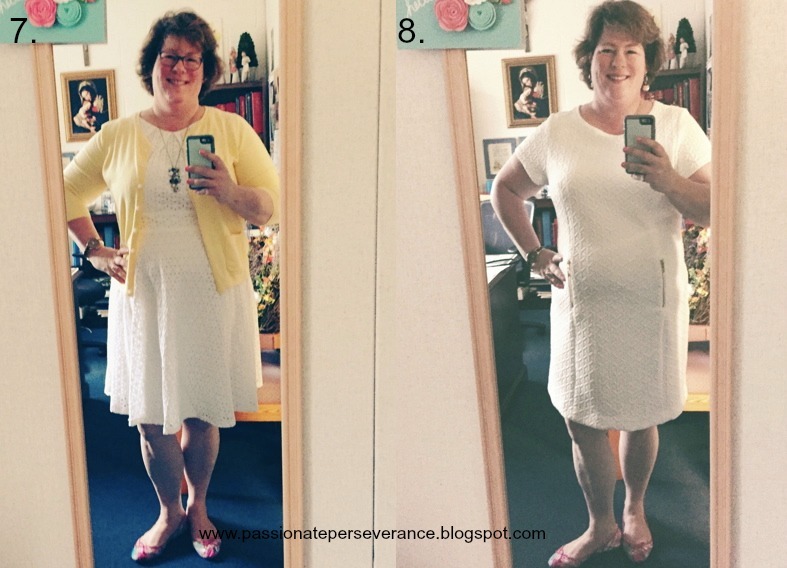 #3 – This knit dress from is a new addition to my wardrobe and I am really happy with it. It’s light and very comfortable. I can dress it up or down. It has an angled hem which makes it very contemporary. I am wearing it with my green ballet flats from Talbots and my favorite Kendra Scott necklace, in green of course. 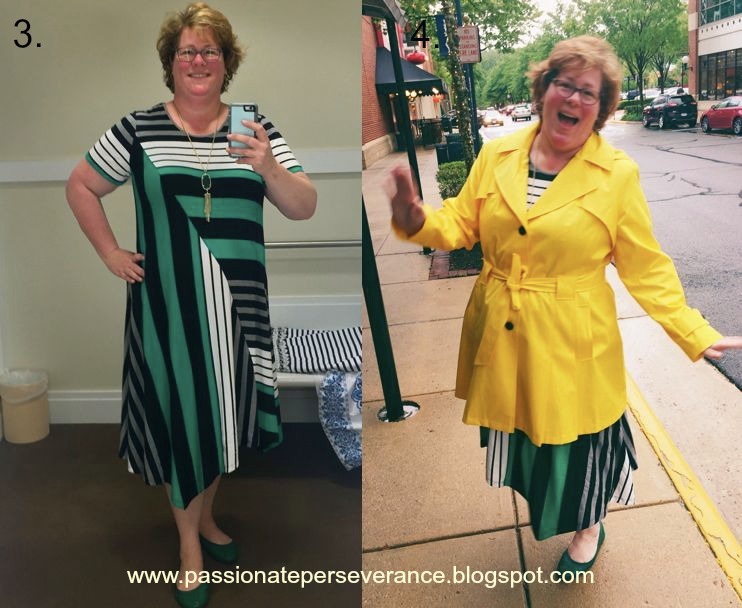 #4 – My canary yellow rain coat. I love it. It’s not new or old or anything but awesome. I have worn it nonstop through the month of may and into early June. SO much fun!! #5 – Sometimes I have to go in on my day off to finish paperwork or polish brass candle followers or drop off dry cleaning or reset the altar or whatever. It calls for comfy clothes that breathe and move but can still be worn in a professional atmosphere. This sleeveless top and coral patterned cropped pants are from Dress Barn. The fitflops are awesome and so comfy. #6 – Last Sunday was Corpus Christi Sunday. It was a long day filled with four Masses and a Eucharistic procession followed by Benediction. It was very warm and muggy so cool comfort was the name of the game. Of course color is always my happy place. This skuba fabric is bright and full of personality. It was just what the ticket. Let’s talk white shall we. I have not worn white many times over the years. All I could see was Courtney sneezing her spinach souffle and it would be all over. Since my girl now dances around the clouds of heaven, I feel a bit more confidant in my wearing of it. #7 – I wore this today. This cotton eyelet fit and flare has been in my closet for a few seasons now. I paired it with yellow cardigan and a long necklace and my favorite gingham flats. #8 – I wore this shift dress on Friday night for our parishes Confirmation Mass. I paired it with my gingham flats and simple earrings. It was a marathon of a day and as always, comfort is key. We had 86 Confirmandi, one bishop, seven priests, two deacons and 825 family and friends who joined in the celebration. It was a full house and a beautiful Mass. Such a wonderful sacrament. So there you go. 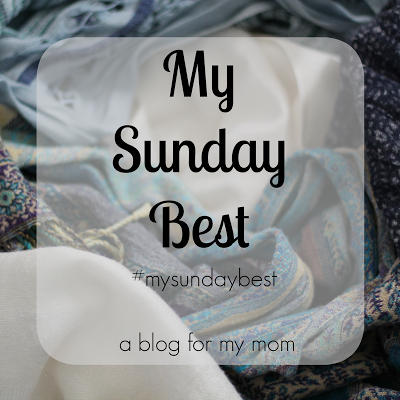 All caught up with “My Sunday Best”. 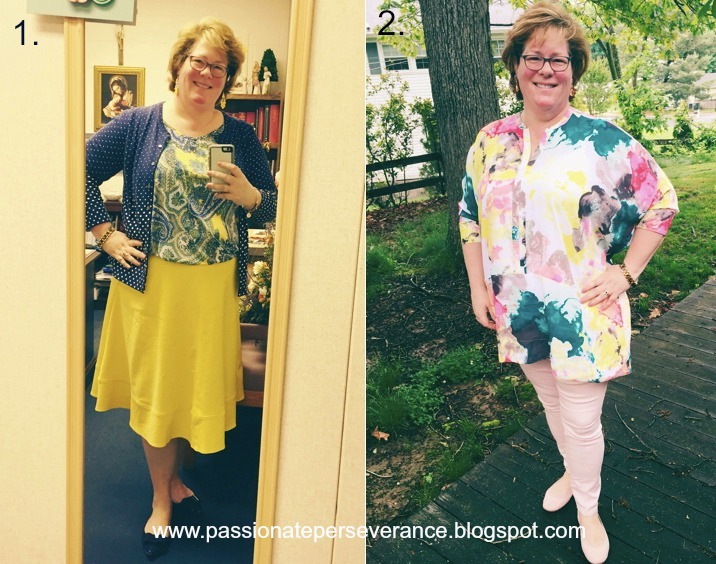 Head on over to Rosie’s at A Blog for My Mom to check out a few other bloggers and celebrate their sense of style. « june?? seriously?? for real?? I think the yellow coat was my favorite! You rocked the canary yellow! Thanks friend. It is one of my favorite colors for sure. Chock full of style! I love the yellow skirt outfit and the floral dress best 🙂 The pink jeggings are tricky – on my phone they look the same color as your skin? Might just be the filter, but I think there needs to be more contrast. Love the outfits! I LOVE the pink jeggings! But the white eyelet fit-and-flare is the real star for me. I am such a sucker for eyelet! Thanks Colleen. The white eyelet was just $30 at DressBarn. One of my finest purchases! I love all your outfits, Mary! You are such an inspiration! Ok, I love them all. You are too cute! I wore navy with polka dots for Mass today (not a cardigan, but a dress). I simply adore that white tank with the dots and the yellow raincoat! Just lovely! Blessings Laura. Thanks for the encouragement! I love #6 dress. It looks really nice on you. I admire your courage in choice of color. I myself don't wear white as I feel it makes me look "bleh". Paring it with the yellow sweater takes it off the chart. Keep up the good work. It's such a pleasure seeing you and your family blossom after all those hard years. Miss Courtney continues to look after us from heaven Vicki. We are truly blessed. Thanks Sarah!! You're the best!! I have the yellow skirt in my closet, it was my Easter Skirt, I love the fit and the color! It is a very forgiving skirt TwoCents. That's why I bought it. 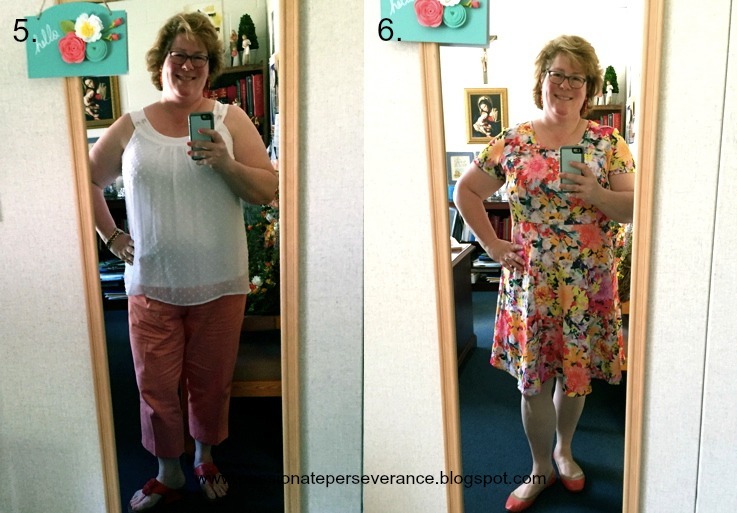 Looking this post over again, and I also love that white eyelet fit and flare dress. You really do dress beautifully! Thanks Laura. Dress #3 I found at Lane Bryant. It was an impulse purchase and I wasn't sure I was gong to keep it but it just works. Aww Rachel you are so kind. Thanks for the compliment. I just love your outfit posts! Thank you! You are inspiring and beautiful!